Performance Length: 3 x 40-minute or 2 x 1-hour sets of songs, or 2 x 60 minute sets of dancing in a 3-hour period. 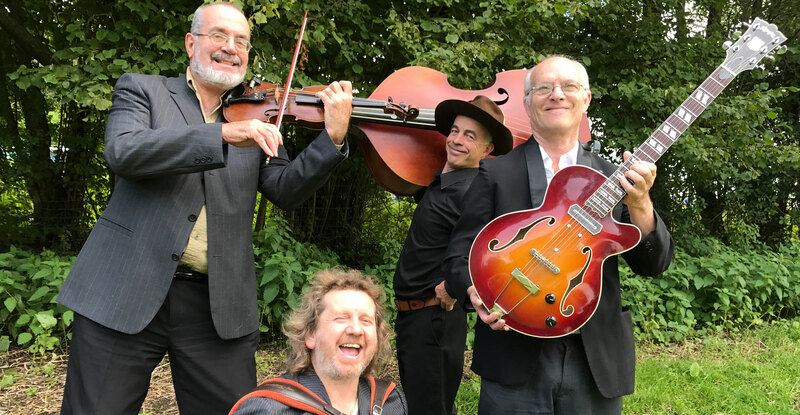 A professional band with two decades experience, Black Velvet Band can provide you will a first class Barn Dance, Ceilidh and Irish Ceili and an American Hoedown – or even a brilliant set of Irish songs and tunes performed in simple café style. Looking for a different “take” on a Christmas party? 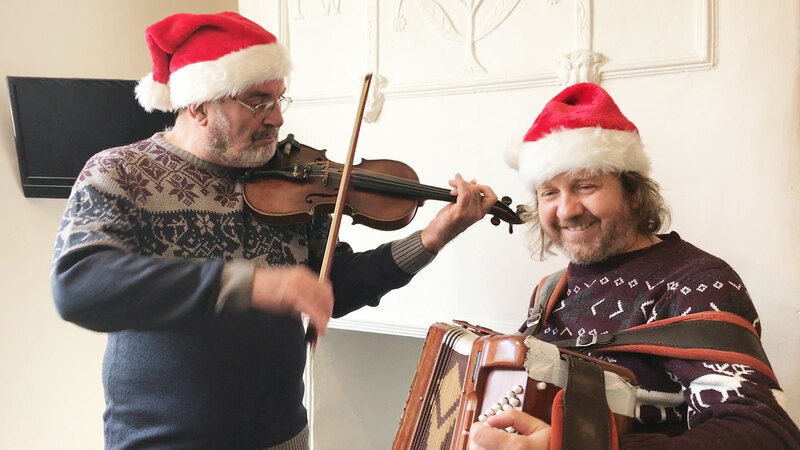 You will enjoy a Christmas Ceilidh! 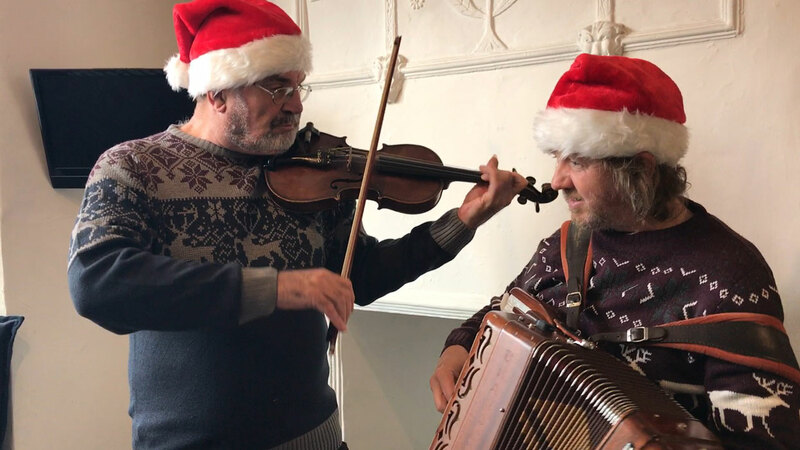 Jase and Mike from Black Velvet Band Ceilidh Trio have set lots of traditional carols and popular songs as dance tunes. The band, of course, dress in their best Christmas jumpers and Santa hats! The band’s flexible line-up depends on the style. The virtuoso fiddle-playing of Mike Evans dominates the sound. An accordion and fiddle sit at the heart of the Scottish style. Want to go Irish? Guitar and excellent vocals join the fiddle and accordion along with double-bass. Nashville-style bluegrass fiddle-playing leads the Hillbilly Hoedown sound. The band is happy to include a session or two of organised dancing in ceilidh or barn dance style.Don’t worry if you’ve never experienced these styles of dancing before. It’s easy! The band’s specialist ‘dance-caller’ will explain and show you how. Anyway, getting mixed up and tying your feet in a tangle is half the fun – it’s not ‘getting it wrong’, it’s all down to individual interpretation! Want to go Scottish? The dance-caller will include all the tried-and-trusted favourites such as ‘The Gay Gordons’ or ‘Strip The Willow’. 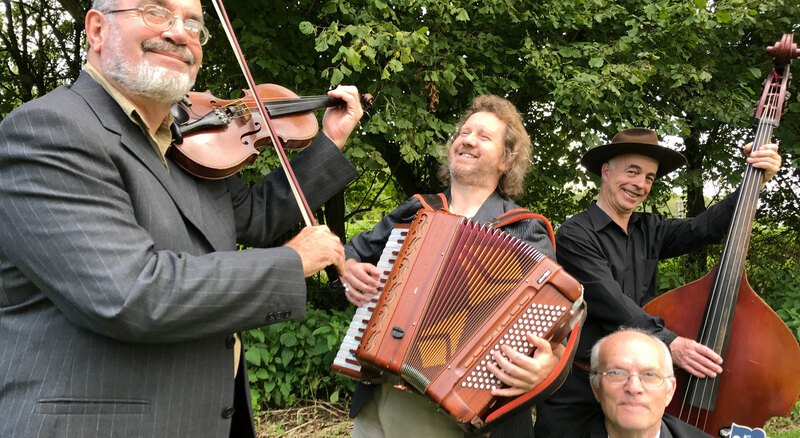 If you’d like a ceili, Irish-style, Black Velvet Band will throw a few well-known Irish songs into the mix, and give you ‘The Siege Of Ennis’ and ‘The Bridge Of Athlone’. Prefer to pull on your cowboy boots, a kerchief and Stetson and wheel out your dos-y-dos at an American hoedown? These guys will treat you to a real down-home hootenanny, Texas-style. Additionally, the guys can round the night off with a set of Gypsy-style Swing Jazz. Ceilidh, ceili, barn dance or hoedown? BVB is simply the best! It’s The Most Wonderful Time Of The Year Let It Snow! Let It Snow! Let It Snow! Well what can I say? Johnny and Jase are a great duo! They performed a super mix of Irish songs and tunes and had people up dancing all night. What a great way to celebrate St Patrick’s day at our Cons club! The performance went amazingly well! The dance floor was full on a SUNDAY AFTERNOON?? I put that down to the guys who played songs and tunes with such an exciting beat that you just couldn’t stay still. The whole afternoon was huge fun. I highly recommend the band. Mike and his band played for Martin’s 60th birthday barn dance. They made it a very special night full of lovely memories. Alan was a fab caller. Navigated us through the dances with humour and laughter. Alan was extremely helpful and empathetic towards one of our guests who is blind and called dances that she could join in without making it obvious to lots of guests. Many didn’t even realise she was not sighted. 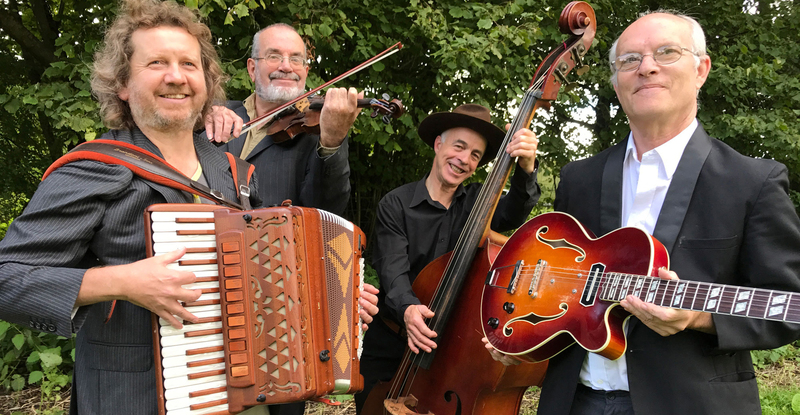 We had many comments from our guests who complimented the band on the accordion player, Mike the fiddle player and Alan our caller. A great trio and we really recommend them! Thank you guys! Wow! What an evening we had! We absolutely LOVED our wedding evening and you absolutely made the night! We LOVED the dances, and so did all our guests. I couldn’t get over how good you all were! Thank you SO much for being such an excellent band, to plan with before our wedding and to perform on the night. We’ve attached some photos, which we hope you like too! Thank you ever so much, and should we ever need a band in the future, we’ll be sure to get in contact with you! Please can you pass my compliments on to the band for the wonderful job they did on Saturday last. Our guests have been absolutely raving about them! They were so good in fact I think they tired most of us out after 3 dances!! We both really appreciate how organised, friendly and accommodating the band were and would not hesitate at all about recommending them to our family and friends. If there’s anywhere we can also leave a review online, we’d also love to do that too. They really made our day so special, our first dance is one I’ll always remember and the smiles on people’s faces as they had fun dancing “The Siege of Ennis”! “My legs are still aching because I danced so much! The band arrived on time and were very friendly and helpful and the music was delightful. It was a mixed crowd, many of whom had never met each other before but with one thing in common – they had never done ceilidh dancing before! The caller was absolutely brilliant – it didn’t matter that most people had no idea how to dance the reels! Everyone joined in and thoroughly enjoyed themselves. Black Velvet Band Ceilidh Trio were a fantastic edition to our Burns Night celebrations. From communicating before the event to the actual day, the group were professional and easy to reach. They also went above and beyond what their initial brief by ed by agreeing to toast the haggis – which was met with cheers – and taking suggestions from the crowd for different dances. By the end of the night they felt like part of the ROSL family. Many thanks to the Black Velvet Band Ceilidh Trio for a fantastic 21st Birthday Ceilidh. The band provided a perfect balance for the young and young-at-heart, catering for everyone from the super-lively, to wheelchair-friendly dances, which was a lovely touch. Everyone had a great time. We booked the BVB for our wedding in April at Stonehouse Court. We specified Celtic music and they were excellent – they even learned a song for me to sing with them in two weeks flat! True musicians who really know their stuff. They were punctual and did not skimp on time – not taking lengthy breaks between songs which I know some do. A really great experience – I thoroughly recommend them. Black Velvet Band Irish Duo performed at my Mum’s surprise 70th birthday. We loved the performance and didn’t want them to stop! The party was a huge success and the excellent music really helped to create the atmosphere. Thank you very much, guys! Amazing night with joyous music from the band from start to finish. Very accommodating for our age span of 8 years to 80 years! Plenty of caller participation to get us all going in fun dances which everyone said made them ache the next day! I heartily recommend them. Very friendly too! We have booked Black Velvet Band for our Wedding in Devon on 20th May. We were delighted to find out from Jennie that they were playing at The Water Poet in Spitalfields on St Patricks Night. Being from London, this was perfect. We arrived to a heaving pub with great Irish tunes belting out the door. The pub was packed and everyone was Irish on Friday. Black Velvet Irish Band played everything from The Wild Rover to some traditional reels and jigs. The were excellent and we cannot wait to have them play on our special day. We met with the lads after who were all so friendly and welcoming. I’ve been in a quite a few pubs on St Patrick’s Day but I’ve never experienced an atmosphere like that. The crowd were singing and dancing, Black Velvet your were fantastic, we cant wait to see you guys on 20th May 2017. The band set up according to the plan that had been agreed and once the music got underway, the dance floor was packed for the whole night. Some of our guests had never been to this type of evening before and all we had back was extremely positive comments about the band and of the whole evening, which was to celebrate our daughter’s 30th Birthday. The band was an integral part of the night and made the night go with a swing. Vicky and I are just back from a wonderful honeymoon in Thailand. We would like to take this opportunity to thank you, Mike and all the Black Velvet Band for playing at our wedding. For some it was a new experience hearing a traditional Irish band perform. Go raibh míle maith agat!! Just wanted to say thank you so much for the music, fun and sheer merriment you provided on Saturday. It was an absolutely cracking party, everyone had a blast and my parents loved every minute! Your music was perfect, you had everyone up singing and got everyone in the party spirit. Everyone has been passing on their thanks and regards, so just wanted to say thank you for making the party such a special and memorable occasion. We’ll all be there in force at The Water Poet in Spitalfield’s London next year on St Patrick’s Day, so we’ll be sure to come and say hello again! Thanks again, it was brilliant and hope you both enjoyed it too. Just wanted to say thank you to the Black Velvet Irish Band. For the second year in a row, Eddy, Mike and Johnny were an absolute crowd pleaser and everyone had a brilliant time on St Patrick’s Day at The Water Poet in Spitalfields, London! We were really pleased that we had booked the Black Velvet band for a ceilidh at our daughter’s wedding at Old Down Manor. Before the event they spoke to our daughter and planned with her exactly what she would like from them, the type of music and how they would organise the evening so that she and her new husband could be ‘danced out’ at the end. On the day the band arrived in good time with all the appropriate equipment for the location. The performance was very professional, the music great and they got all the guests dancing along. The caller’s instructions were clear. So overall we were very happy and would definitely recommend them and the ‘Hop Til You Drop’ administrative team. We celebrated our wedding at The Grange and we would like to thank you for helping to make our evening so enjoyable. Everyone said what a lovely idea a ceilidh band was and how brilliant it was that it included everyone. Thank you. Black Velvet Band helped make the Souldern Village Ceilidh a great success. Ours was a Village event with all ages and the Band got all ages dancing. They played superbly and brought a caller with a good sense of fun. They provided music to dance to, music to listen to and an entertainment show all in one! On a practical level they were professionally early arriving, leaving the event organiser relaxed and free to have a drink! Greatly appreciated in all regards. We had a fantastic time with the dance floor full. Everyone enjoyed themselves. The band were excellent and were very accommodating throughout the evening. They were patient and very encouraging in getting people to participate. Thank you very much for making my wife’s 50th birthday celebrations special! Delightful Scottish jigs and reels from Sue and Mike combined excellent calling from Henry had everyone on the dance floor, reeling into the small hours. We shall be booking the band again next year. Thank you for the wonderful ceilidh on our wedding day. Everyone had such a fun time and loved the dancing, even those of us who had never done it before! You provided just what we wanted for the special day, despite being so close to Christmas and with terrible weather, and it was a highlight of the evening. All the best! Dear Mike, Jason and Terry (in no particular order) Thank you so much for your part in a lovely evening. I realise now what a creative act a barn dance is, requiring co-operation (co-ercion??!) (gently done!!) from all sorts of assorted people. We had a fabulous time, and I shall treasure the looks of thorough enjoyment on each of the dancers’ faces. I just wanted to say such a huge thank you for the amazing performance that you gave. You were so friendly and willing to help in any way that any nervousness about getting up to dance was immediately dismissed. I was extremely apprehensive prior to the night about how the dancing would go down, especially with my two left feet! However my worrying was in vain, what a fantastic night of dancing it was, so inclusive that any and all can get up and get involved, aged 5 or 105. You need no experience or talent, just listen to the brilliant calling, it’s all simple moves but when it comes together with all your friends and family on the night, prepare to be amazed. I can not thank the band enough for making our Wedding such a fantastic night, I have never seen so many people thoroughly enjoying themselves all at once. I can sincerely recommend the Black Velvet Band for any social occasion, your expectations will be exceeded. We would just like to thank you very much for a brilliant evening of music and dancing at our wedding. We have had a lot of great feedback about how fun you were, you even made the ‘non-dancing’ people dance! We really enjoyed it, thank you very much. Just wanted to thank the Black Velvet Band for a really great evening last Saturday. They were excellent musicians and the caller was superb (very patient with the Danish contingent who took some time to get the hang of the instructions!) What I particularly appreciate is how considerate and adaptable the band was regarding my wishes. I had lovely time and have had a lot of positive comments from my guests. Black Velvet ceilidh band played at my daughter’s wedding on Saturday. Please let them know how excellent they were, and the evening was a great success greatly helped by the excellent calling, music and dancing. I have had lots of good comments from guests and would recommend them to anybody. The band were an absolute delight, just the right mix of professional musicians and informal enough to mix in with people and jolly them along. They were completely marvellous and everyone had a great time, even though some people had never done ceilidh dancing before and were a little shy.